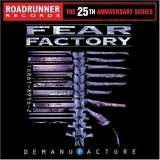 FEAR FACTORY - DEMANUFACTURE ROAD RUNNER 25TH ANN. RE-ISSUE (2CD) | Online Shop | Wizard LTD. Album: "DEMANUFACTURE ROAD RUNNER 25TH ANN. RE-ISSUE (2CD)"